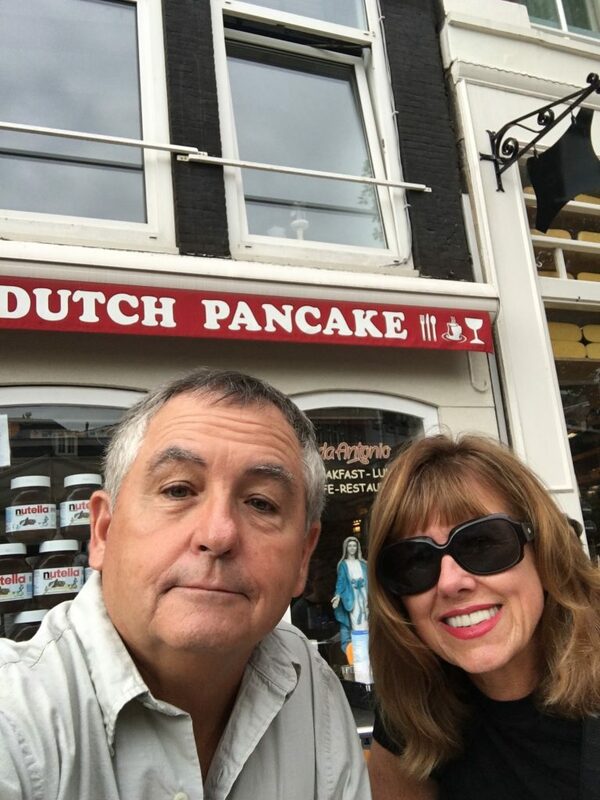 We started our day with Dutch pancakes, which are really like crepes. On our way to breakfast we ran in to Edwin, our apartment host. He told us that Amsterdam folks hop on the train and head for the beach on warm, sunny days like today and tomorrow. Tomorrow, he is going early to the beach to avoid the crowds on the train. When it comes to Amsterdam museums, we saved the best for last. To avoid the lines we got our tickets for the Rijksmuseum in advance, but unlike our tickets for the Van Gogh and Anne Frank museums we did not need to come at a designated time. We had thirty days after purchasing out tickets to use them, Built in 1885, the beautiful Rijksmuseum is dedicated to arts and history in Amsterdam. A lovely garden surrounds two sides of the museum. We used the informative free app, www.rijksmuseum.nl/tours to guide our visit. Among the 8,000 objects on display, Rembrandt’s works are the stars of the show. 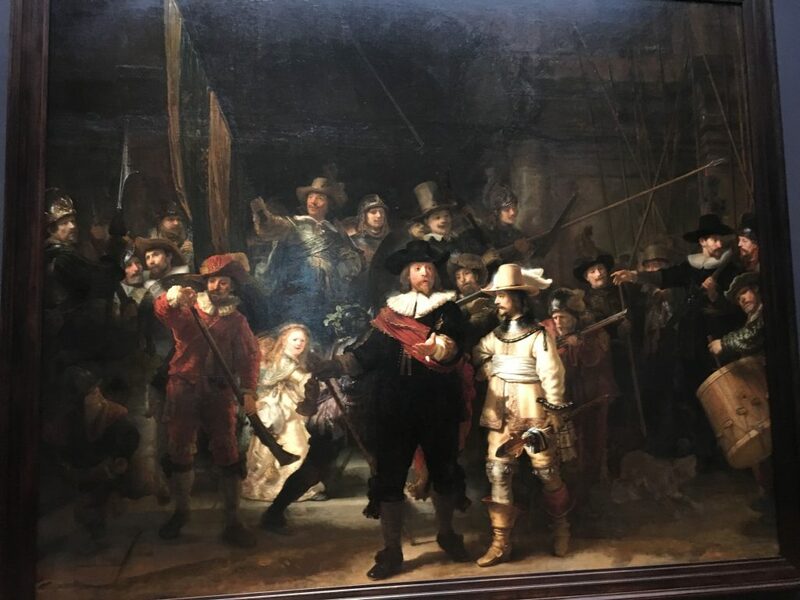 His The Night Watch is the most famous painting in the museum and had by far the most people viewing it. 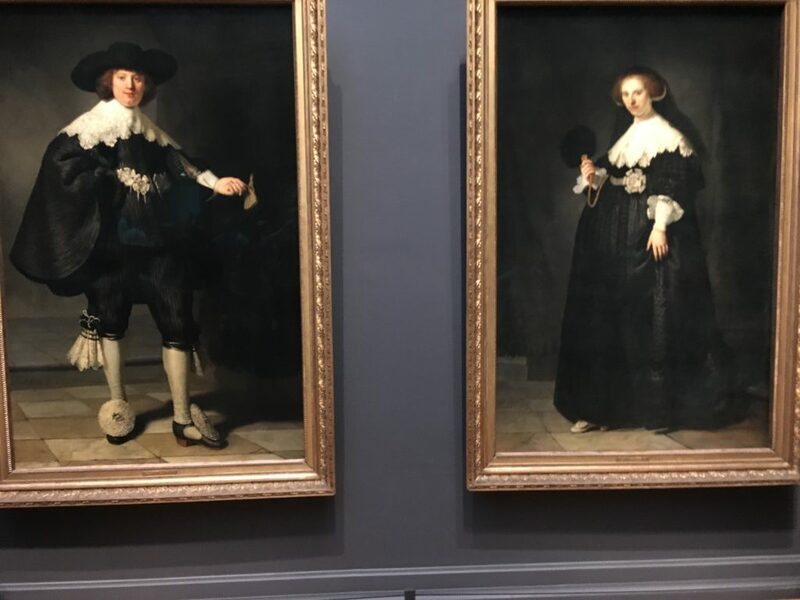 Two other Rembrandt masterpieces were acquired by the museum in 2016 for 18 million euros each. Marten and Oopjen are the only life-size, full-length standing wedding portraits Rembrandt ever painted. Since portraits like these were reserved for the nobility, this young couple was obviously very successful. 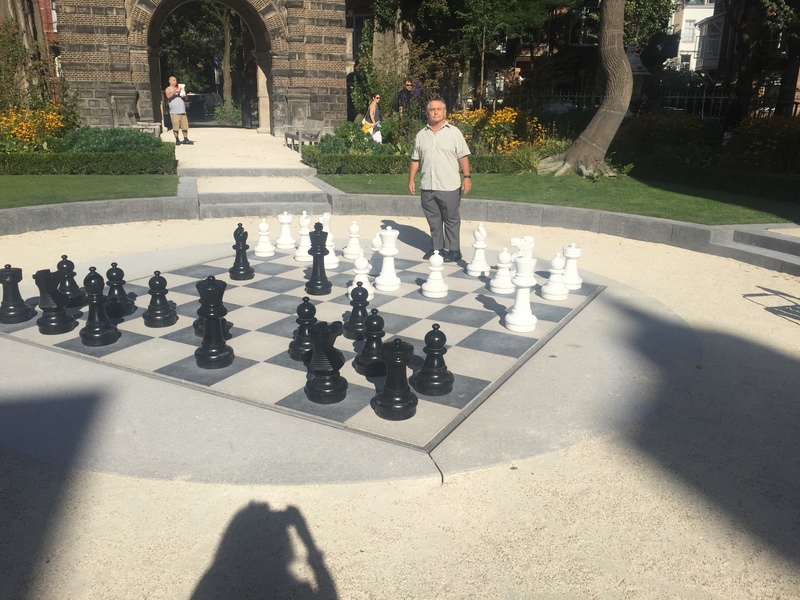 There were so many beautiful and interesting things to see in this museum that we are already talking about spending more time here the next time we come to Amsterdam. 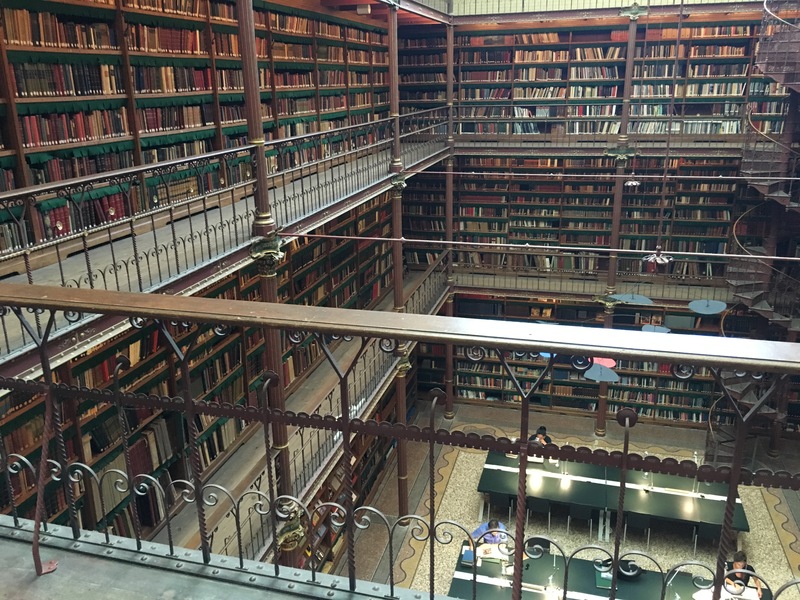 The stunning library in the Rijksmuseum is the largest public art history research library in the Netherlands. 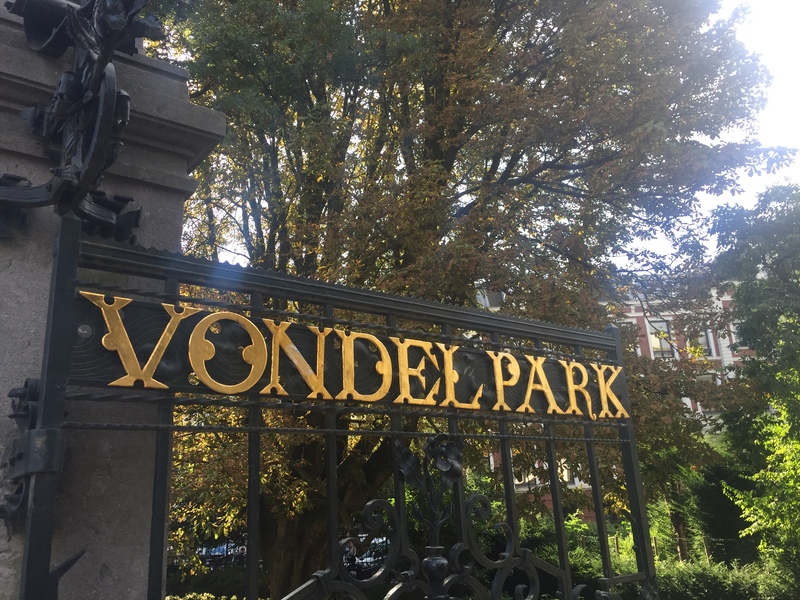 After our mix-up a few days ago, we got better directions and found Vondelpark today. It was a beautiful day for a walk in the park and a nice picnic. We crossed a small bridge that had lovers’ locks like we had seen in Paris. 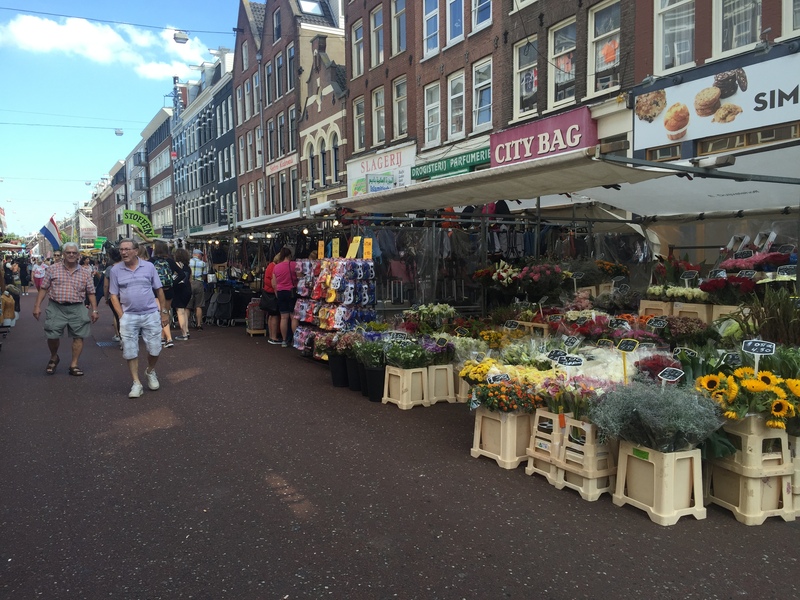 We love exploring neighborhoods, so we planned our walk home from Vondelpark through the De-Pijp neighborhood and had fun browsing the Cuypmarkt, the largest and most popular market in the Netherlands. 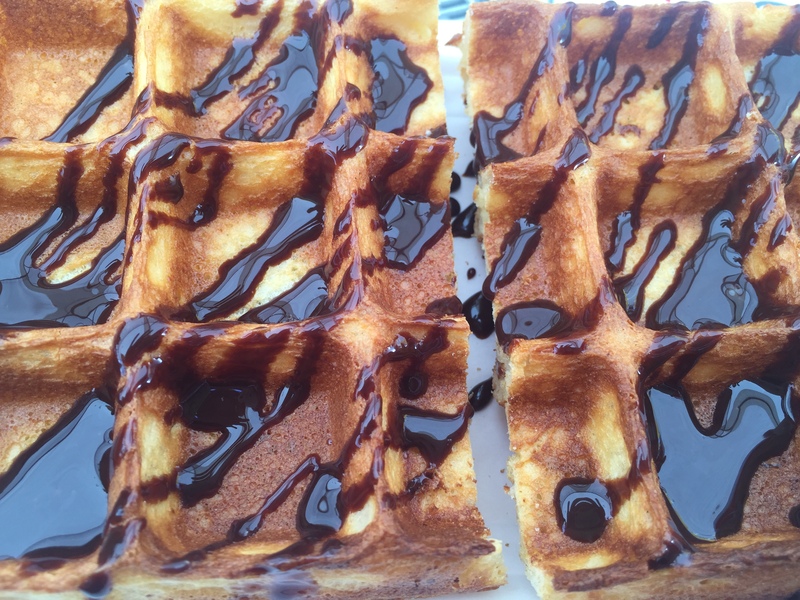 We had a yummy waffle with chocolate. 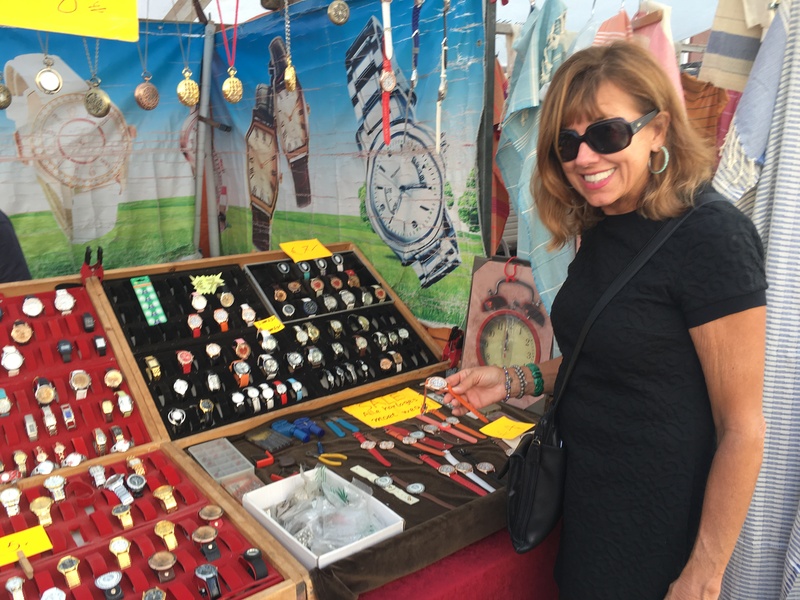 Since I left home without a watch, I was thrilled to get a watch for four euros. If it only lasts until the end of my trip, it will have served its purpose, and it is pretty cute. 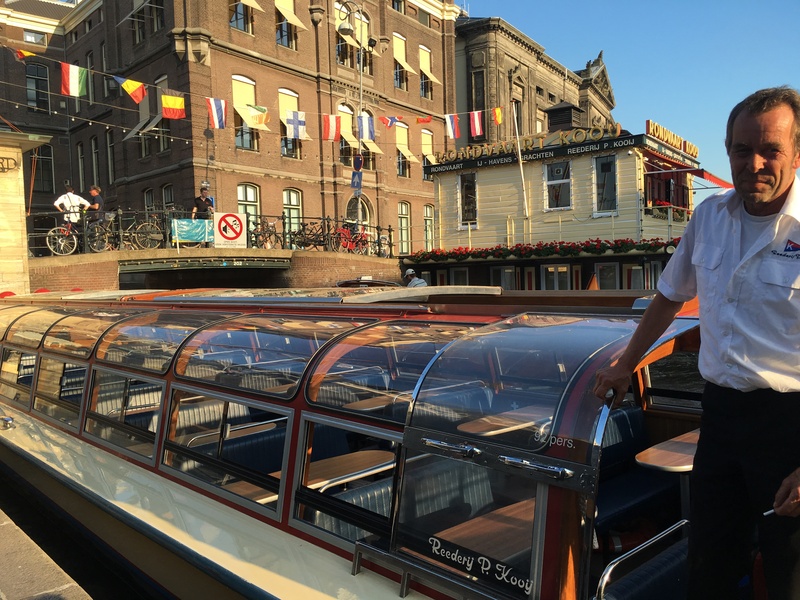 Tonight we took a canal cruise, a classic Amsterdam activity, with Rederij P. Kooij. We chose that company from the many Amsterdam canal cruise companies because they were closest to our apartment. Our captain, Willem, was an interesting guy who liked to share additional information with us because we were the only English-speaking passengers and were sitting in the front. We learned that every year they retrieve about sixty bodies and fifteen thousand bicycles from the canals. 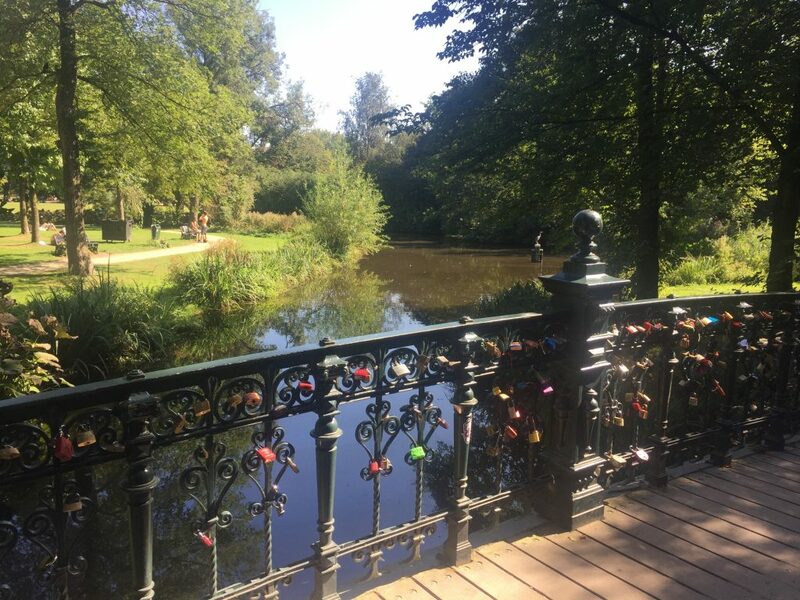 This entry was posted in Amsterdam, Bruges, Paris 2016 on September 12, 2016 by debbie.